My mom started me hand sewing at a very young age, and she let me start sewing with her machine when I was about 8 or 9 years old. She would let me use up her scrap fabrics in the summer and I would create all sorts of clothes and sleeping bags for my dolls and stuffed animals. I loved figuring things out and making up stuff on my own. My mom and I started taking quilting classes when I was 14 or 15 and I was hooked! We have taken many quilting classes together since then and I have also designed quilting patterns that in my Etsy shop. I started bartering sewing lessons for piano lessons and eggs from some of my friends 3 years ago and found out that sewing isn’t taught in school anymore!?!? I started offering a few sewing classes to my friends and their kids and then a year later started offering Summer Sewing Camps. Sewing has helped me create beautiful things for my family, friends, and home and has been my creative outlet. My goal in teaching young students to sew is to help them get excited about creating something independently and feel empowered to try something new—and hopefully continue sewing on their own and use their own creativity to make new things. Most beginners come in very nervous and wonder if their projects will turn out or if they will finish–it is priceless to see their proud smiles when they finish, and they always do! Sew Little Beginner Summer Sewing Camp is for ages 6 and up. Students will have lots of fun learning how to thread the machine, sewing machine safety, hand stitching, and making: tic-tac-toe boards, bookmarks, button closure clutch, lined tote bag, and owl pillow. Sew Basic I Summer Sewing Camp is for ages 8 and up. Students will have lots of fun learning how to thread the machine, sewing machine safety, sewing bias tape, sewing a zipper, and making: an infinity scarf, pillow case, Anna tote bag, lined zipper pouch with ruffle. Match with Me I Summer Sewing Camp is for ages 8 and up. Students will have lots of fun learning how to thread the machine, sewing machine safety, sewing zippers, and making: necklaces for student and doll, headbands for student and doll, embellished elastic skirts for student and doll, and zippered sleeping bag for doll. This is a new class this summer! Match with Me II Summer Sewing Camp is for ages 8 and up. Students will have lots of fun learning how to thread the machine, sewing machine safety, hand sewing fabric yo-yos for headbands, how to make ruffles, and making: headbands with hand sewn embellishments for students and doll, pillowcase dresses for student and doll, bracelet bags for student and doll, and ruffle apron for student and doll. Sew Basic Plus Summer Sewing Camp is for ages 11 and up, or students who have taken classes with me previously. Students will have lots of fun learning how to thread the machine, sewing machine safety, sewing vinyl, using pellon, sewing on velcro, sewing zippers, and making: zippered shark pencil case, Travel pillow with piping, fabric stand-up bin, and vinyl velcro closure pouch. Classes run from Mondays through Thursdays and specific dates and times are listed in the photo. Cost of the class is $135. Please contact me through FaceBook (https://www.facebook.com/SewSweetCottage/) if you are interested and I will send you an email with registration information. I am requiring a $35 registration fee which is non-refundable to reserve your spot. This amount counts towards your total tuition, so the remaining $100 will be due on the first day of class. Fabric supply lists will be emailed out in May and students do not need a machine to attend–my classroom is stocked with machines for each student! Finally took the plunge, and have moved my blog to WordPress! We had so much fun on our trip, and relaxed!! It was heavenly. It reminded me how much I love my husband—and I love our crazy life together!! I was also reminded of how amazing my parents are…..they took all my kids, ALL of them to build-a-bear. TO THE MALL—that is just asking for trouble, I warned them!! And they ignored me and did it anyway, and it turned out great!! Their crazy courage and their attitude of never backing down from a challenge or hard work is why I love and admire them so much. And it spoke volumes how much they love us to sacrifice their time for us—I know it wasn’t a vacation for them!! Thank you, thank you, thank you!! Taking some R & R…. My husband and I rarely get to spend time alone with each other—we’re so busy finding babysitters, or not wanting to pay babysitters, making sure Justin and our kids are okay….we don’t go out on dates very often—let alone get-a-ways! But after my husband accrued so many miles travelling last year, we are finally cashing them in and headed off for a vacation!!! And I am so excited…Thanks Mom and Dad for watching the kids!!! Life got out-of-control crazy the past few months, and it is just starting to settle down again….PHEW!! We did reach a great milestone last month of 15 years of marriage!! Here’s some pictures of that awesome day 15 years ago…seems like just yesterday!! We rarely step away from the kids and go out together, it just gets so complicated with the Autism and the severe peanut allergy issue that we usually just stay home!! BUT!! It was our fifteenth anniversary, so we actually left the kids with my parents overnight—awesome break for us, and a restless night of chasing Justin for my parents!! Did I say thank you?!?! Thanks Mom and Dad!! Because, it was so nice to step away for an evening. I am super sentimental, if you couldn’t tell already, and I spent most of the day during my anniversary trying not to cry because of how blessed I feel!! I love my husband—he is amazing and handles our stressful life with so much love, compassion, and patience. Happy 15th Anniversary Sweets!! I can’t believe it has been fourteen years since we got married—but then again, it feels like we’ve been together forever. But after being married to my husband for fourteen years, after all the crazy trials we’ve endured and the mind-boggling journey of raising a child with Autsim—I can say that my husband was the perfect match for me. Poor guy!!! Who else would not only deal with the trials, but make furniture or help me with any of my crazy projects??? That is true love. Thanks for sticking it out with me honey!! I love you!! We finally made it back home from vacation…without any incident with Justin—yay!! We had such a great time with family and I have many blogging things to catch up on this week including; some fun recaps of my baby girl’s first b-day, cousin carnival, seeing my 96 year old grandma, and some great fabric finds!! My favorite part about blogging is all the new friends I have made. Michelle from Michelle’s Tasty Creations is one of those friends!! She is always sharing great recipes and is such a nice person—which is why she received the Sunshine Award!! And she was nice enough to nominate me!! Thank the person who gave you the award and link back to them. Answer 10 questions about yourself. Select 10 of your favorite bloggers, link their blogs to your post and let them know they’ve been awarded the Sunshine Award! Don’t forget to copy and paste the award on your blog! 1. Favorite Color – Just one?? Currently, it is teal. 2. Favorite Animal –miniature schnauzers, used to have two, and hoping to get another one someday. 3. Favorite Number –my favorite number is 26, ever since elementary school. 4. Favorite Drink – Sprite, sprite, and sprite..
5. Facebook or Twitter – Facebook. 6. Good Book or a Good Movie – What about Bob is my classic favorite, although I love a good mystery! 7. My Passion –capturing a memory with something tangible. It’s how I feel I’ll never lose the beauty of that moment. Scrapbooking, taking pictures, creating something all make that dream come true..
8. Giving or Getting Presents – Giving! I love plotting for months what I’m going to give people for their birthday! 9. Favorite Day – Any day where my whole family is home together. 10. Favorite Flowers – I don’t like red roses, other colors are okay but I really love spring bouquets with wildflowers.. 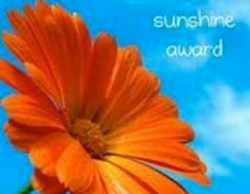 The 10 blogs I’m awarding the Sunshine Award to are (in no particular order). Go check out their blogs and you’ll see why I love following them!! Happy Friday!! You can now follow me with Bloglovin!! Raising a child with Autism is like riding a roller coaster—we always have our ups and downs. These past few weeks have been full of both!! On the “up” side of things, one of Justin’s therapists has taught him the value of pointing for things that he wants. He knows how to point, but usually ends up pulling at our arms to get us to go to the pantry or to show us what he wants. Justin’s sweet little therapist told me she’s been putting Justin on her shoulders and talking him for walks during therapy and letting him tell her where to walk by pointing. She’ll stop in the hall and say, “Where do you want to go?” And then she waits for Justin to point and then she takes him that direction. He things this is the GREATEST THING EVER!! 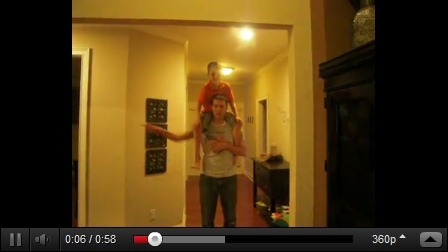 One night Justin climbed up on my husband’s shoulders and I told him that he wanted to play the same game he does at therapy. So my husband got up and walked him around the house and Justin squealed with joy the whole time and couldn’t stop laughing!! It was SO sweet. And guess what?!? I love all of Justin’s therapists, past and present. He’s going to be getting new ones for the summer and I have such a hard time saying goodbye to all of them!! They will always be part of my “Team Justin.” I am so grateful for their love of my sweet boy and all of their inspiration in helping him grow and develop.